Thanks for the tool but did you see a need for this? 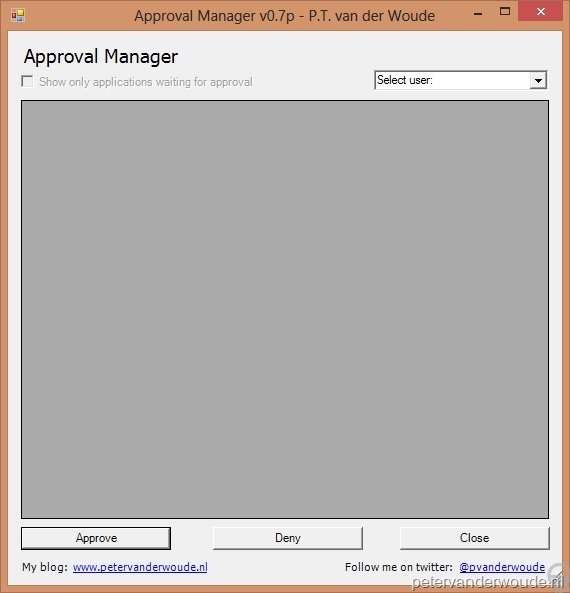 What I see at customer side is that the ConfigMgr guys just don’t have the internal authority to approve or deny apps. Most customers are asking a flow where the particular manager can approve. So I mostly extend this with SCORCH. Probably you suggest in that case that all managers need to install your tool locally? In that case I would certainly built-in some alerting to avoid that a manager needs to check this all the time. Thanks for your comment. You are correct, two times in a row! In most cases ConfigMgr guys are not the people with the internal authority to approve, or deny, apps and, in the ideal situation, this functionality can be extended via Scorch and/ or SCSM. This tool is meant for local usage, so manager can approve, or deny, apps (without the need of a console) and for those organizations that do NOT (and are not willing to) use the complete System Center stack. Thanks for you’re suggestion about alerting! I will look into that. Our organization wants to deploy software to over 4000 users. Authorization is required. Do you know if there is a way to do a bulk add to the list of requests? It would be good to add them as approved already so we don’t swamp the one person who does the approval. Could this be a “module” of your tool? I haven’t looked it like that before. Also, I don’t know if it’s actually possible. Main reason, the user must perform the request.